MyCRM Blog | MyGeoMap and Managing Opportunities; See it to Sell it! ← Microsoft Dynamics 365 – MyPDFCreator; helping you to keep your cool this summer! Dynamics 365 and CRM provide excellent assistance to help sales people navigate the road towards a sale and the ultimate glory of the close. Over many years and multiple iterations, Microsoft has continually improved functionality to allow for better control of the sale throughout the process, irrespective of the duration. The only thing missing is providing any visibility of opportunity based on geographical locations. What Microsoft fail to provide is provided by using MyGeoMap, to pinpoint all of your sales opportunities in a map view. If you sell on a global scale, you’ll be keen to see a world map – with every opportunity evident in view. If you sell locally or based on specific territories, your map can reflect this using Dynamics 365 and CRM’s inbuilt filtered views and advanced find functions. You can change the view by selecting a filter and switching your viewpoint. The result may be very different to what your map originally displayed. Oh dear, only 2 opportunities meet the filter criteria (below). Time to up our game! Whilst list views and pipeline charts of opportunities are good (and they are really good), they simply only allow the users to dig a little further and interrogate the sales data. 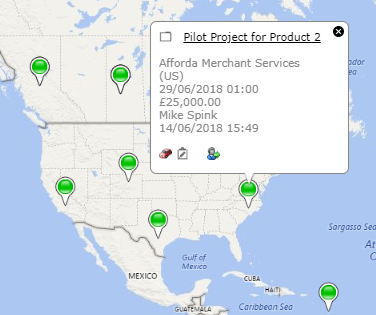 With MyGeoMap, users can instantly see where sales opportunities are located, and by clicking on each opportunities location pin, you can see on the label what the opportunity is comprised of and what customer it represents. The label displayed can be configured to support any view that a user desires, so you might want something simple; value, close date, customer account etc. or maybe you’ll want to include product or customer/account related information, record ownership, competitor/s, or just about anything that your opportunity entity contains. You can pick from all available fields that exist. So MyGeoMap provides you with freedom to configure views to look at things the way you want to. This is extremely important to further encourage end user adoption of Dynamics 365 and CRM by giving users personal choice. In addition to the location pins, you can also view your opportunities using standard MyGeoMap heat map functionality. This gives you the hot spots on where your opportunities are. This is a great view to use as it provides a clear picture on where you are trending the most potential (or previous) sale success.